Contact Tony now for your quote. Tony is helpful and reliable with meetings and callbacks leading up to your wedding. Greg Poppleton makes your wedding music personal. He works with your guests to match the atmosphere and vibe of your reception on the day. When Amalia and Jacob held their cocktail wedding reception in the small vintage Golden Age Cinema in inner city Sydney, Greg Poppleton was a natural fit. Amalia and Jacob chose the Jazz Deco trio. With Greg Poppleton singing authentic 1920s-30s vocals were guitar doubling banjo and sousaphone doubling trombone. The size and design of the room needed only a small PA.
Amalia and Jacob used the band mic for their speeches. During intermissions, Greg played from his exclusive collection of rare 1920s radio band recordings during to keep the vintage theme. 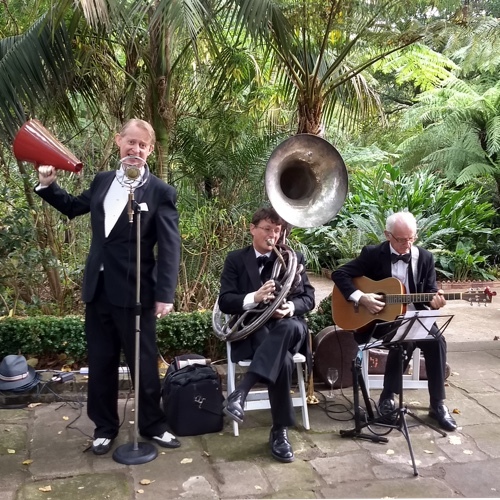 For Jennifer and David's wedding in the gardens of Hopewood House, Bowral, the Greg Poppleton brass-string jazz duo played before the ceremony. Then Greg sang to guests in the garden for pre-dinner drinks. Being an acoustic band, outdoor garden receptions are a natural for Greg Poppleton. We have also played vineyard weddings. Greg and the band can be either wholly electricity-free (with Greg singing through a 1920s megaphone) or plugged in if there's an outdoor power point. For outdoor, garden and vineyard receptions, the band simply requires a shaded location with a dry and level surface. Marguerite and Andrew's wedding reception was held in a beautifully restored boho chic milking shed in the grounds of Seacliff House overlooking the ocean at Gerringong NSW. They selected the Greg Poppleton quartet with Greg singing in the authentic 1920s-30s style, plus baritone sax doubling alto sax and clarinet; guitar doubling banjo; and sousaphone doubling trumpet. Marguerite and Andrew picked their play list from the Greg Poppleton song list. They also asked Greg to sing their special song 'At Last'. 'At Last' is from the 1941 Glenn Miller Orchestra movie, Sun Valley Serenade. It was most famously recorded by Etta James in 1960. Beyonce sung it at Barack Obama's presidential inauguration. Because of the milking shed size and acoustics, Greg Poppleton used two 200W speakers for vocals, guitar and banjo and speeches. These speakers were supplied at a special Greg Poppleton band discount. Aleis's and Simon's traditional and glamorous wedding reception was held outdoors and in a grand marquee. They chose the Greg Poppleton quintet to create a mood of vintage chic with real 1920s-30s style for background and dancing. “Live 1920s – 30s jazz and swing adds spark, style and glamour to receptions no other music can,” says Greg. Because of the large number of guests, Greg Poppleton used two 200W speakers for vocals, speeches and the guitar / banjo. The rest of the band of multi-instrumentalists was kept acoustic, including the trumpet and sousaphone, alto saxophone, baritone sax and clarinet, washboard and drums. The result was good, even sound at a level where guests could easily talk with eachother. Greg prides himself on playing at a volume that creates mood rather than blasts. Only excellent musicians have the skill to play softly. “We both thought that the music was fantastic and we couldn’t have asked for more from you in fulfilling our requirements and helping to create the ambience we were looking for. All the band looked amazing on the day and we would like to thank you wholeheartedly for the effort you put into the music and the look, dealing with you throughout has been exemplary. Regularly we listen to your Phantom Dancer CD especially when we have people over for dinner! We are hopeful that sometime in the future we are in position where we need music for another purpose (maybe for our first child’s birthday party!) as we know who to ask first! We will recommend you to all we know as the results you produced were simply delightful.